Hello Chicago - Sheridan Music Studio Presents! Arrive at the luxurious Sheridan Music Studio by car, train, bus and you will be greeted by your elegantly attired hosts, International Steinway Artist Susan Merdinger and Pianist Steven Greene. Then enjoy a gourmet wine and cheese reception with the other guests and any visiting artists as we prepare for your personalized private concert. Relax by settling in to the comfortable leather seating in our vaulted -ceiling Great Music Room, where you will be entertained by us with one hour of glorious Classical Music featuring us performing on our gorgeous new Steinway Grand Piano and a Baldwin Grand Piano, along with other instrumentalists and vocalists. (The program and Guest Artists will vary by date and are subject to change). Prepare to be mesmerized with our virtuosity and depth of musical expression as we entertain you with our Classical music as well as informative, entertaining commentary on the music. A short question-answer period will round out the entertainment portion of your evening. This exclusive and personal experience will conclude with a Dessert and Coffee Reception, and an opportunity to talk personally with the artists and other attendees. Susan Merdinger is an internationally-acclaimed, award-winning Concert Pianist who loves to entertain people from around the world with Classical Music. 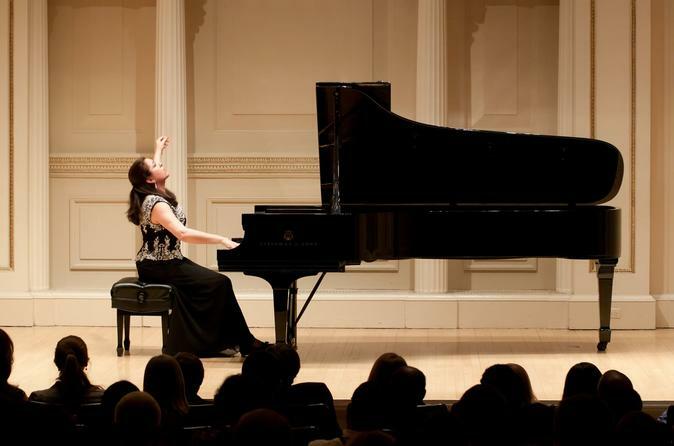 Ivy-League and Conservatory trained, Susan Merdinger enjoys a busy performance career as a Solo Steinway Artist, Visiting Artist of the Chicago Symphony Orchestra, and frequent Guest Artist on WFMT, Chicago’s Classical Radio Station. Susan Merdinger dreamt of being a classical concert pianist since the age of six, and has gone on to realize those dreams!